Bret Michaels with his autographed copy of THE RED FANG. Before I start this, I want to make it clear that this article isn’t really about Bret Michaels having a copy of my book. Bret does not endorse me, he is not affiliated with me, and I can’t say he’s a reader of mine, although it is possible he might become one, if I’m super lucky. I suppose I should start from the beginning, but to do that would be to go back approximately twenty-seven years, back to when a gawky thirteen year old was living in hell on earth in an abusive home, back when she heard salvation on the radio, a voice, his voice, the voice of the man who would forever change the outlook a scared, abused thirteen year old girl would have on life. I don’t want to rehash the past because it’s too painful, and I have come too far and wrestled with too many personal demons to start dredging up old pains. So instead, let’s just leave it with saying my home life growing up left a lot to be desired. But no matter how hard things got, my saving grace through it all had been Bret Michaels. I have often posted about why Bret means so much to me, why he is my mentor. I see in him a kindred spirit, someone who won’t take “no” for an answer and is unphased by rejection. I see my love of music and the creative process mirrored in his eyes, the expression on his face. Because of him, because of his ability and willingness to look adversity straight in the face and say, “I will make it regardless of what you say or do to me,” I too have felt inspired to never waiver in my dreams of becoming a published author. It is through Bret’s courage that I have found my own courage to not only keep writing over the past three decades, but to take that step into the publishing world by creating my own publishing house and becoming a 100% independently published author. So I know you are all wondering what any of this has to do with this blog article. Let’s fast-forward to January of this year when I came across the Bret Michaels FaceBook Fan Club community. I was already a member of so many groups and communities, but after looking through this one I wanted to be a part of it. So many smiling faces sharing photos of themselves and Bret over the years. It was awesome to behold, so many people who had been touched by Bret much the way that he has touched me over the years. 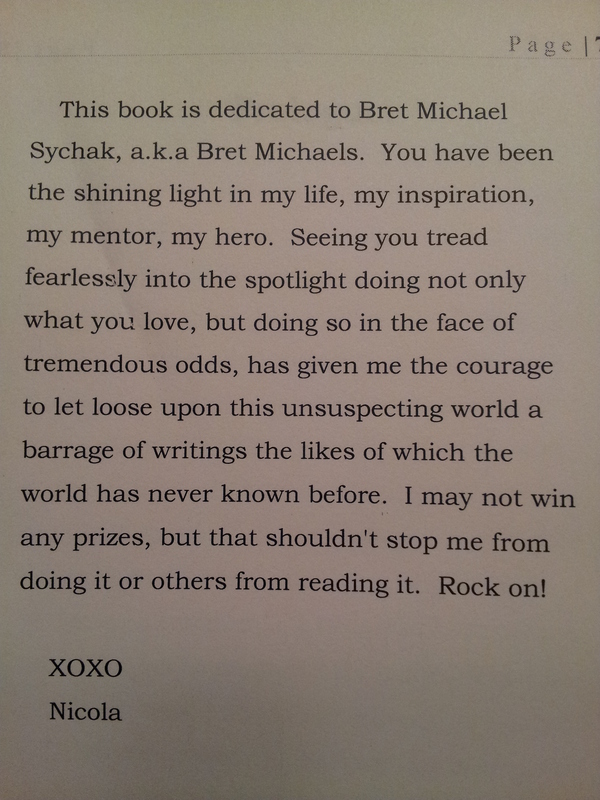 If anyone has actually read The Red Fang, you know that the book was dedicated to Bret. That’s a photo of the dedication page above. More than anything else, I wanted Bret to know just what he means to me, not only the ‘me’ that has grown up over the years, but the ‘me’ that is a writer, that part of me that can’t stop doing what I love no matter how many rejection letters I get and no matter how many bad reviews I get. So I took a chance. I posted this photo in the fan club and pretty much confessed my desperation to get my book into Bret’s hands. I work full time, I have 3 kids and a husband, and I write whenever I get a few spare moments. The chances of me actually ever getting to meet Bret, much less be able to give him my book in person, just isn’t likely to happen. So I asked if someone was going to a meet and greet and would be willing to give Bret an autographed copy of my latest novel, the novel I dedicated to him. Would there be anyone out there who would be willing to take a book written by some independently published author, from Mississippi no less, to an uber famous rock star and say, “This book is dedicated to you and the crazy self-published author insists you have a copy”? That is when I met super cool, totally awesome, I-am-forever-in-her-debt Bret Michaels fan, Connie Saucier-Peck. Connie, the luckily lady that she is, has been to more meet and greets than I can count. She’s like a Bret Michaels connoisseur. And oh-so-lucky and over-the-moon-happy me, she was willing to use her meet and greet pass, her one shot to speak with Bret, her one time to interact with this man, to actually hand him MY book and tell him he has another crazy author-fan out there who dedicated a book to him. That in itself is absolutely phenomenal. It’s humbling to know that Connie was willing to share her precious seconds with Bret to speak about a no-name author who she met in an online fan club and hand him his autographed copy. The real kicker is that she not only managed to talk him into taking a photograph holding the book, but that Bret Michaels is the kind of person who was willing to pose for such a photo. She didn’t have to ask, and he didn’t have to agree to it, but damn, when she sent me this photo I started crying, and I was shaking so bad that I had to sit down. There simply are not words to describe how excited, and humbled, and totally awe-struck I was at that moment. I still can hardly believe it. And when she told me that Bret handed over his own personal cellphone to one of the event staff members so he could get a photo of him holding the book as well…I am not ashamed to admit that I might have wee-wee’d myself a bit. As I said, this article isn’t about the fact that Bret Michaels now has a copy of my book, which Bret Michaels might actually, accidently read it, maybe, hopefully, if I’m really, really lucky. What this article is about is the human spirit, those people who come into our lives and help out strangers out of the kindness of their heart. Connie did not have to waste her time taking that book to him, and she certainly didn’t have to get him to pose with it for a photo, and she didn’t have to send me that photo, and Bret didn’t have to agree to take the photo, but out of the kindness of their hearts, they both agreed to help this unknown, struggling author see part of her dream come true. And from where I’m sitting, those dreams don’t seem so far out of reach.